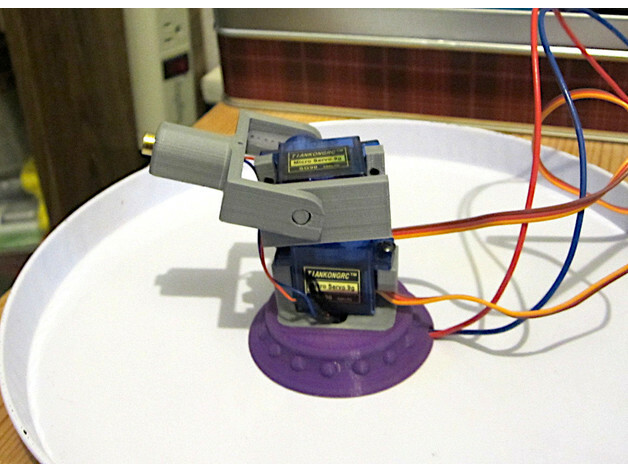 Laser Gun Bracket Remix #3DPrinting #3DThursday « Adafruit Industries – Makers, hackers, artists, designers and engineers! JeffT shared this project on Thingiverse! A Remix of mandle’s wonderful Thing. I added a base to press fit the bottom bracket. Made the recesses for the servo arm form fitting so as not to require messy glue, added thicker arms on the middle bracket as they popped off when trying to screw in the servo. Also added a round cylinder for the laser diode. It’s a little loose, but a bit of electric tape near the end of the diode makes for a snug and removable fit. Made the holes and peg on the middle and top bracket smoother.